(CNN) -- The Brazilian military said late Friday it is calling off the search for bodies of passengers and crew from the Air France plane that crashed into the Atlantic earlier this month. 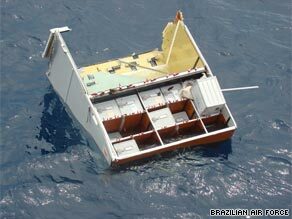 Wreckage from Flight 447 spotted by search teams in the Atlantic last week. It was unlikely that any more bodies would be found, the military said. So far, search teams have found 51 of the 228 people who died when Air France Flight 447 plunged into the sea June 1, according to the military. They have also found more than 600 parts and structural components of the plane, along with luggage, the military said. The bodies were handed to Brazilian authorities for identification while the debris and luggage were given to French aviation investigators, the military said. In the 26 days of the search operation, the Brazilian air force used 12 planes along with aircraft from France, the United States and Spain, the military said. The Brazilian navy used 11 ships. Ships remain in the search area hundreds of miles northeast of Brazil in an effort to find the flight data recorders, the Brazilian military said. Last week investigators said they were running out of time to find the recorders which could prove crucial to working out what caused the disaster. Officials remain in the dark about what caused the airliner to plunge into the sea off the coast of Brazil. The wreckage is believed to be about 15,000 feet (4,500 meters) deep, amid underwater mountains and mixed in with tons of sea trash. A French submarine and other vessels are searching for black boxes by attempting to trace their locator beacons, which send out acoustic pulses, or "pings," to searchers. The U.S. Navy has contributed two high-tech acoustic devices -- known as towed pinger locators -- which have been attached to French tug boats and can search to a maximum depth of 20,000ft (6,100 meters). The firm which makes the recorders, Honeywell Aerospace, has told CNN it has a 100 percent recovery record from air accidents. Honeywell said it was hard to estimate how much battery life the locator beacon on the recorders had, as it depended on the conditions, but it is typically around 30 days. One recorder taped radio transmissions and sounds in the cockpit, such as the pilot's voices and engine noises. Sounds of interest could be engine noise, stall warnings, landing gear extension and retraction, and other clicks and pops. From these sounds engine revs per minute, system failures, speed and the time at which certain events occurred could often be determined, according to the U.S. National Transportation Safety Board. CNN's Claudia Dominguez in Atlanta, Georgia, contributed to this report.